When my husband Jason became a Certified Professional Life Coach, I immediately knew that one of his areas of expertise could easily become weight loss coaching. 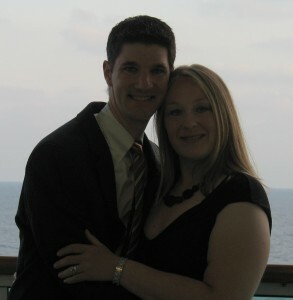 He has been my pillar of support through my tremendous journey of losing nearly 100 pounds– and keeping it off. 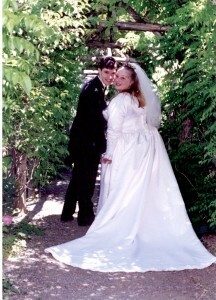 If you look at our wedding pictures from more than ten years ago, you would hardly believe that was me. Okay—not only did we look like babies (why does skin have to lose its elasticity anyway?!) More importantly, I weighed almost 300 pounds. I always chuckle. I can’t help it. Quite honestly, it’s not rocket science. My old-fashioned advice is to count calories and to exercise. (Energy in, energy out, people!) If you would like to trade tips on the actual dieting, calorie counting, and fitness routines, please email me. I’ve tried it all! Honestly, any diet program works—if you stick to it! Exercise should be enjoyable, and gradually increase in intensity and variation. Don’t do the same routines all of the time. The tricky part and the modern twist is to do the difficult emotional work of exploring your addictive behaviors towards food. Until you work through the complex emotional addiction you have to food, you will never lose weight and keep it off. Now, some of you may be thinking, “I am not a food addict.” Well, if you are overweight, you DO have an emotional, addictive tendency towards food. Otherwise, you wouldn’t be overweight. For example, in much the same way a non-alcoholic is able to simply drink a sip or a glass of wine, and not the entire bottle plus some, a non-food-addict is able to resist certain foods and make healthier choices and not gain a significant amount of weight. In the same ways an alcoholic has intense difficulty avoiding more than one sip or glass of wine, you lose the same type of control with food, and that is how you became overweight. Others of you out there reading may not need convincing. You know that you’re a food addict. Good for you! You are already on a pathway to success because you are honest with yourself. Until we are honest with ourselves, we cannot lose weight and keep it off. In much the same ways we are fully honest with other people in our lives, we owe it to ourselves to be honest with ourselves. We need to own our behaviors. Just as you would hold a child responsible for an inappropriate behavior, you need to hold yourself accountable for behaviors that are not in your own best interest. The key is not to be too severe and hard on yourself, though. Just as you would not punish a child too harshly, keeping yourself in that “poor me” space can be horribly destructive. When you discipline a child, you teach him how and why the behavior was wrong, and show him ways he could behave differently next time. He may have a time of penance, but everybody then moves forward. We don’t allow the child to remain in a “woe was me” attitude. As adults, we ensure the child has acknowledged the behavior, but we also encourage him to move forward in healthier ways. As recovering fat people, we must all do the same. Don’t stay in “poor me.” If you do, you perpetuate more cycles of feeling sorry for yourself, which leads to further overeating. So, why are you fat? Do you honor your body or do you abuse your body? Do you honor food, or do you abuse food? What are your triggers for overeating? What are some healthier behaviors in which you could engage, rather than in eating? If you do slip up, (because we are human and we will!) how can you avoid the path of “poor me” which inevitably leads to further overeating? Some of you out there may identify as a fat person. I know I did! Do you know who you are without the fat? I have read a lot of weight loss books, and as far as I have read, no one ever warns you about three pinnacle parts of losing weight. First, you will experience anxiety. That is because you don’t have your “go to” element anymore—the food. You need other, comforting, healthy things in your life to help you through the anxiety. As I lost more and more weight, and deeply tackled the emotional issues that arose with my weight loss, I experienced anxiety for perhaps the first time in my life because I wasn’t numbing myself with food. Find healthy outlets for yourself—friends, walking, gardening, music/dancing, volunteer work, or any other things you find relaxing. Third, weight loss is a loss. Loss requires healthy mourning. Be sure to mourn in a way that resonates with you. You will need to mourn the loss of clothing and other material objects to which you never realized you held such weird, emotional connections. (Get rid of my XXXL snowman decal jumper? Are you crazy? No—I was the one who was a little nuts. Get rid of it!!!) You are not the clothes, the fat, or anything else through which you have been identifying. Take this precious time to figure out who you truly are. Mourn who you have been, in order to celebrate and welcome in the person you are becoming. The human brain never ceases to amaze me. When my father had a stroke two years ago, of course I was sad. However, I was also intrigued. His brain activity was fascinating to me. His short-term memory has been wiped away. He cannot retain information for longer than a few seconds. His long-term memory is still fully intact, though. This is common in stroke victims. That is because our short-term memories are housed in the front of our brains, and our long-term memories are housed in the deeper parts of our brains. Well, just the same as the front part of our brains house short-term memories, this same part of the brain also houses short-term gratification, like the short-lived pleasure we get from things like food, cigarettes, or whatever floats your boat. And, just as the deeper, middle part of our brains house long-term memories, that part of the brain also houses long-term satisfaction, like a deep, fulfilling sense of joy, or the freedom that comes from forgiveness. Why am I telling you this? Well, my father, who had been profoundly addicted to cigarettes, food, and gambling for many years, showed absolutely no interest in any of those things after his stroke. He does, however, still remember and care about loved ones in his life, and all of the other things that truly matter in life. Without having a stroke, I suggest we all take a lesson from this, and concentrate more on the deeper, middle parts of our brains, rather than in the short-term gratifications that get us no where, and that just don’t matter in the end. Using this deeper part of our brains requires hard work, but it sure is worth it! If you would like support in your weight loss journey, please contact a coach. It’s hard work to lose weight. It’s the hardest thing I’ve ever done. It sure is worth it, though! My life is transformed. Hugely moving, Christine. That took guts, and you did it beautifully. Kudos. Christine – thank you for this honesty. I’m amazed by this journey and by your frankness with the steps you go through along the way. I hope others are as inspired as I have been to leave behind what is comfortable for what is truly fulfilling. This topic is so near and dear to my heart-thank you for sharing it! So few understand that a real change cannot be made without addressing both the physical and mental sides of a problem. So inspiring! Absolutely beautiful. You’ve revealed truths that take some a lifetime to learn. Thank you so much for sharing. I happen to know quit a bit about you, that others have not been exposed to. I find it so refreshing to see an honest straigt forward approach to weight. loss. as you know I have been slightly over weight all my adult life. I to follow the carories in/calories out program for weight maintanence. Christine, You brought tears to my eyes. Thank you for your openness and honesty. You are AMAZING!!! Thank you for sharing your story Christine. After having two kids I too am on the journey to weight loss. Your story inspired me. Thank for your encouragement. You look wonderful and deserve to “chuckle” whenever you get the compliments-you have earned it! Intellectually and physically conquering the behavioral aspects of weight is truly amazing. Plus, the way you’ve described the core of the issues strikes a resounding chord. Maybe one day I’ll be able to tell a similar story, but for now, I’m still working through it. I am SO proud of you…your insight, honesty, and authenticity are profound. I respect you, I honor your journey, and I appreciate you sharing your story. As you know, the need to lose weight and become healthy is new to me. It’s a struggle, it’s emotional, and you were right…nothing is there to numb it. The “final thoughts” were more helpful than you know, for those of us who are struggling to lose weight. And the story you shared about your Dad truly touched me. coaching is a practice and a process that helps you learn where you want to go by understanding who you are today.